Comment: has av / power cables. 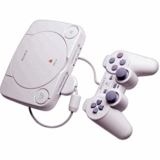 Comment: US PSOne console. Modded. Comment: Lens needs to be repaired. Just here to offload it, maybe to someone who'll actually get it fixed. Comment: Must come with official power supply, AV Cable, and Dualshock controller. Comment: Working with power and av cords.